Growing up, my mom used to make me a German chocolate cake for my birthday. I think my Dad and I loved it the most so there was always lots for me to enjoy. As I’ve gotten older, I don’t have German chocolate cake near as much as I would like but I still love it! 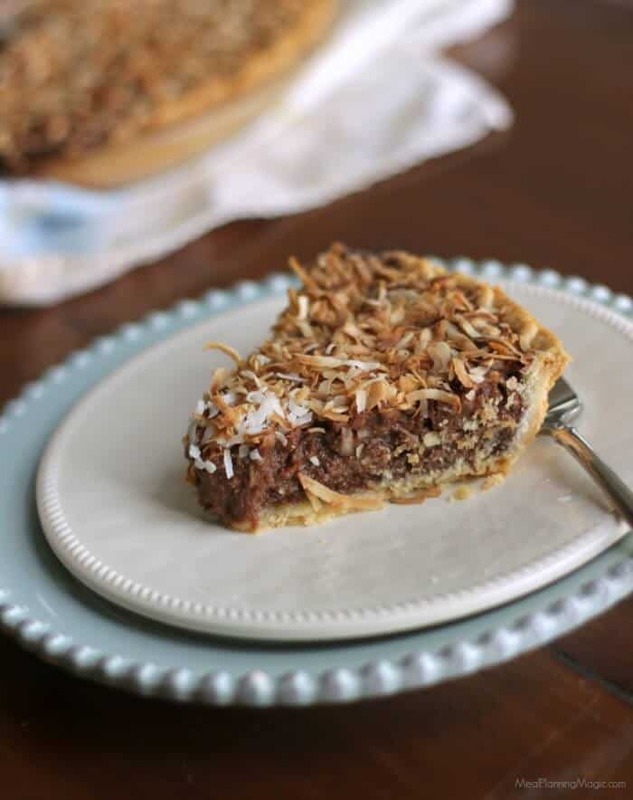 So when I was recently flipping through an older cookbook that my neighborhood women’s club had put together more than 15 years ago, I was immediately drawn to the German Chocolate Pie. I had to try it and I’m so glad I did! 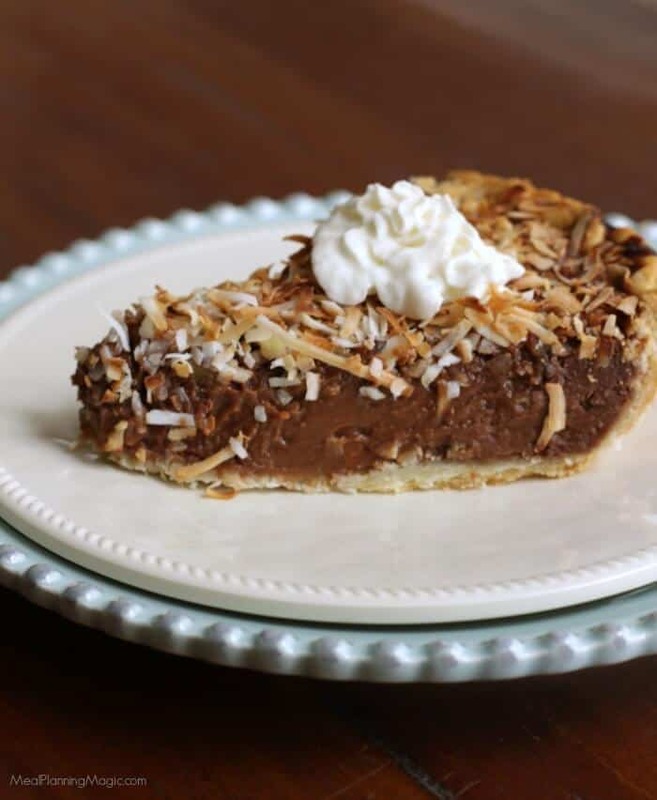 It’s just the right amount of creamy chocolate with coconut and nuts. I love this twist on those classic flavors I love and this pie is really so easy to make. The bonus is it needs to set for four hours so it is a great make-ahead dessert. You can even make it the day before you will be serving it and store it in the refrigerator. I’m always up for make ahead! The filling is creamy but a little thicker than a pudding—almost like a mousse but not quite as fluffy. You’ll just have to try it to find out for yourself! I had to make a few adjustments because some of the instructions were not totally clear (they were pretty basic) and some of the quantiles of the ingredients originally called for have changed. But one thing’s for sure, this is still a terrific little pie for any occasion-birthdays or not! You can serve it plain or with a bit of whipped cream or vanilla ice cream although I think it is sweet enough on its own. 1 4- oz package sweet chocolate this is sold in the baking aisle of your grocery store in bars-check the measurement to make sure you’re getting the right stuff! In medium saucepan, melt chocolate with butter until smooth over medium heat. Gradually add milk and blend with whisk. Add sugar, cornstarch, salt and stir until smooth. Remove from heat and add vanilla and beaten eggs stirring constantly so eggs do not scramble. Gradually blend in chocolate. Pour chocolate mixture into pie shell. Combine nuts and coconut. Sprinkle over chocolate filling. Bake at 375° for 45 to 50 minutes, watching to make sure coconut does not burn. Filling will be soft but will set while cooking. Cool at least 4 hours. Serve plain or with whipped cream or vanilla ice cream. Store any leftovers in refrigerator up to three days. Today I’m joining up with my Sunday Supper friends again for a terrific roundup of pies! You’ll find sweet and savory pies so be sure to check out all the links to find more recipe inspiration! Don’t they sound delicious? 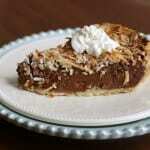 I love, love a German chocolate cake, so this pie is calling my name!!! Liz, it really is so delicious! I hope you try it! This looks great, I love the coconut on the top as well. Oh your pie looks delicious!! 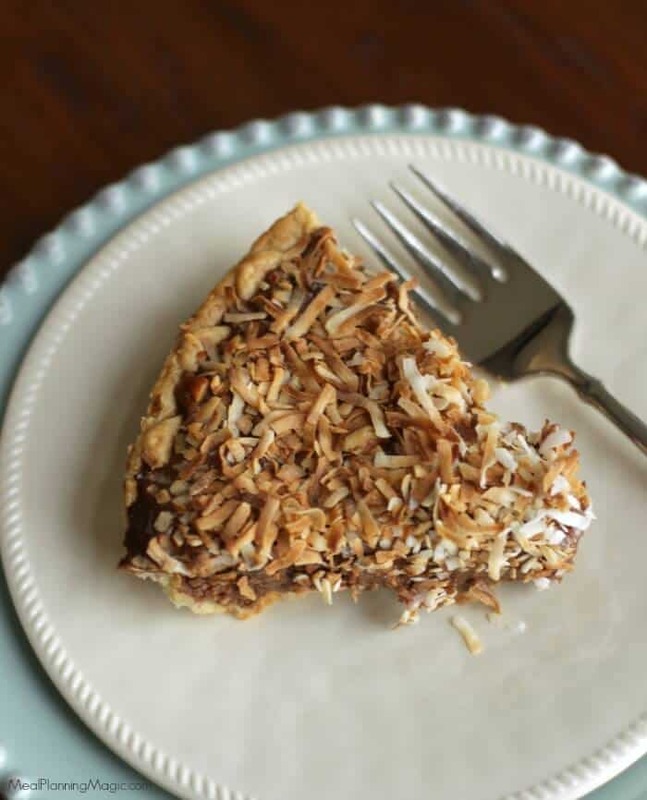 Love the toasted coconut! It’s a perfect complement to the creamy chocolate for sure! One of my coworkers has an absolute addiction to anything German chocolate… this will be perfect! I hope she likes it too! This is seriously my kind of pie! I can’t wait to try this – the best parts of a German chocolate cake,! Looks exquisite! I’ve always adored the cake and just know I would adore this as well. I am making this pie tonight but had one question. When I have it over the stove and you’re saying to blend together do I need to let the chocolate mixture come to a boil before I at the vanilla? Also I should wait for the mixture to cool down before I pour into the pie pan and correct? Hi Carmen, you don’t want the mixture to come to a boil b/c it could scald and burn. So pretty much just heat over low heat and warm until it’s all blended. I will update that in the recipe to clarify it. I didn’t let the mixture cool much at all before adding it to the pie pan but mine was also pretty thick to begin with (well, not thick like pudding but thicker than just milk). Hope this helps! Hi Carmen, I just saw your comment as I only check comments every 24 hours or so. How did the pie turn out for you? I didn’t let the filling cool too much but mine was not super liquidy either. Let me know how it turned out for you and how you liked it! Hi Brenda, so how did you get the filling to be thick enough to keep the coconut from blending in with the filling before you cooked it? 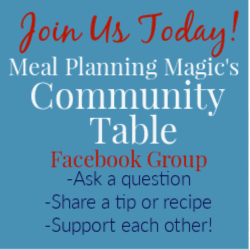 Should the chocolate and evaporated milk have thickened with the cornstarch? Mine was very liquidy and the coconut and pecans just sunk into the filling. It still tasted delicious but didn’t look pretty like your picture with the coconut on top. Any suggestions? Your directions were a little confusing, so once I combined everything with the chocolate, I mixed the eggs in a separate bowl and slowly stirred in the chocolate mixture so the eggs wouldn’t scramble. Again my filling did not thicken until it baked. Hi Carmen, yes the cornstarch would have helped it thicken. One other thing is that I put the pecans on first then the coconut so it sat more on top and I put it immediately in the oven so maybe that’s the difference? You can also add some more coconut at the very end on top to have a layer of coconut just on top of the pie filling mixture. You did the right thing by slowly adding the eggs so they wouldn’t scramble. I would say next time, yes, let it cool slightly so that it thickens. I’m glad you still like the way it tasted though! Carmen, I’m sorry it didn’t turn out for you but am glad it still tasted ok! How long would you say you cooked the mixture before the adding it to the pie crust. I’m thinking I did let it cool slightly but not that much. I will update the recipe.